COOPERSTOWN - Paul J. Lambert, former Cooperstown Central School principal and superintendant of schools and later Director of the Clark Foundation Scholarship Program, as well as a coach and well-respected member of the community, passed away late Wednesday night, December 27, 2017, at Bassett Medical Center in Cooperstown. A loving and supportive husband, father and grandfather, he was 87. Born March 24, 1930, in Sayre, Pennsylvania, he was one of nine children of Harry F. and Mary A. (Murphy) Lambert. A graduate of Athens High School, he attended Hartwick College, graduating with a bachelor's degree in history. In August 1955, he was inducted into the United States Army, and proudly served his country until receiving his Honorable Discharge in 1957. That same year, Paul came to Cooperstown as a social studies teacher, and for seven years was the volunteer director of the Cooperstown Youth Center, which was located above the old fire hall in the village. On July 9, 1960, Paul married Barbara R. Syron in a ceremony at St. Mary's Church in Oneonta, and they made their home and raised their family on Eagle Street in Cooperstown. In 1964 he was named Principal of the Cooperstown Elementary School. 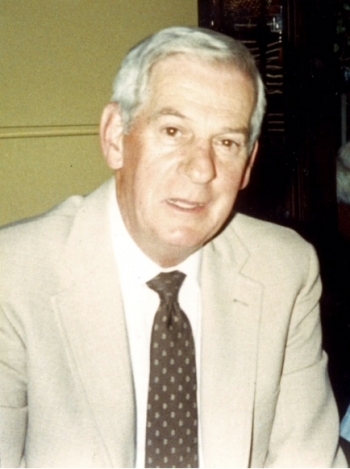 In 1976 he was named Superintendent of Schools, a position in which he served until his retirement in 1987. During his tenure with the school Paul became a well-respected administrator, who was appreciated by faculty members and countless students. He also coached football and basketball, and will be especially remembered for his Championship Varsity Basketball Teams from 1960-1964. Already a member of the Athens High School Athletic Hall of Fame and the Hartwick College Athletic Hall of Fame, Paul was a member of the first class of inductees into the Cooperstown Central School Athletics Hall of Fame in 2008. This was in recognition of all of his accomplishments as an outstanding administrator and coach who brought pride and distinction to the Cooperstown School District and the community. He was further honored in 2010 as the recipient of the Clark Sports Center's annual Patrick C. Fetterman Award for his dedication to serving local youth, especially in the area of athletics. At the time it was noted that, "His accomplishments combined with his character make him a great role model." Paul often said his coaching philosophy was "Play fair, play hard, play within the rules, win graciously and lose graciously", and that discipline and sportsmanship were as important as winning and losing. He always impressed upon his players that they were the same person on the court or the football field as they were off it, and required that his basketball players always wear shirt and tie to away games and act like gentlemen. Upon retiring from the school system in 1987, he became Director of the Clark Foundation Scholarship Program, and served in that capacity until retiring from there in 2004. It was in his retirement that the track and football field at Cooperstown was named Lambert Field in his honor. Throughout his life Paul was a faithful and devoted Roman Catholic, and was a communicant of St. Mary's "Our Lady of the Lake" Roman Catholic Church in Cooperstown. An avid golfer, he enjoyed many rounds with friends at the Leatherstocking Golf Course, as well as the camaraderie of many friends at the Cooperstown Veterans Club and The Mohican Club. He will be fondly remembered for being very supportive of his children's, and later his grandchildren's activities as they were growing up. He served at one time as president of Cooperstown Little League and coached and umpired during the time his three sons were growing up. A familiar presence on the sidelines and in the stands at many football, basketball, baseball and soccer games, he will be sorely missed by his family and the community at large. He truly had a well-lived life. Paul is survived by his wife of 57 years, Barbara of Cooperstown; their three sons, James P. Lambert and wife, April of Albany, Michael J. Lambert and wife, Patty of Fayetteville, North Carolina; and The Honorable John F. Lambert and wife, Katie of Cooperstown; five grandchildren, Derek, Kurt, Jack, Anna and Charlie; five great grandchildren; and many nieces and nephews. He is further survived by two brothers-in-law, Joseph Syron of Schenectady and Michael Syron of Oneonta and a sister-in-law, Mary Ellen Antonucci (Frank) of Milford. He was predeceased by all of his siblings, Harold Lambert, Nora O'Brien, James Lambert, John Lambert, Kathryn Krouse, Barbara Fraley, Charles Lambert and Laura Sharkey. The community is invited to pay their respects to the Lambert Family from 3-6 p.m. Friday, January 19, 2018, at the Connell, Dow & Deysenroth Funeral Home in Cooperstown. The Liturgy of Christian Burial will be offered at 10 a.m. Saturday, January 20, 2018, at St. Mary's "Our Lady of the Lake" Roman Catholic Church in Cooperstown, with Fr. Gregory Weider, retired Priest, presiding. As an alternative to flowers, expressions of sympathy in the form of memorial gifts may be made to the Paul J. Lambert Memorial Scholarship, c/o Cooperstown Central School, 39 Linden Avenue, Cooperstown, NY 13326.